By now you must be really confused by all possible approaches to problems and suffering. There are indeed mixed ideas about how to view them, never mind how to solve them. From one point of view, there are no problems, and hence, there is no suffering (as we create it in our own mind when reality is different from what we expect). From another point of view, problems like suffering are unavoidable and they go hand in hand with life. Hmm… If I had to, I would pick without hesitation the former one… There are of course different versions of the latter one, as to when you do find yourself with problems and suffering, what do you do then? I was so confused by trying to reconcile different perspectives on problems that I even searched on Google issue/problem diagram, chart, decision tree, etc… None were found. 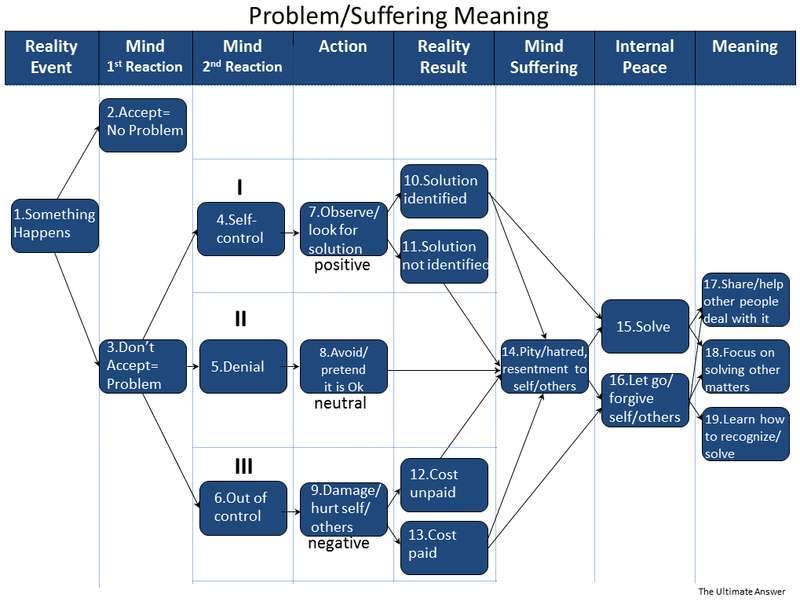 So what I decided to do is to develop a universal process flow with several approaches to Problem and Suffering Meaning that people can use as a decision tree for mind reaction, action, suffering, solution, internal peace and meaning. 4) Self-control and restrain ourselves from acting negatively, but 7) observe/look for solution. 5) Denial – when we (8) avoid the problem and pretend all is Ok; we try to suppress negative feelings, also could be called indecisive or passive approach. 6) Out of control or overreaction – when we act upon our negative feelings and 9) damage/hurt ourselves or others. After we looked for solution there could be two results: 10) solution identified or 11) solution not identified (maybe there is no solution). When we ignore, there is no result in reality, but we are not true to ourselves as we pretend all is Ok, when it is not. In reality we can’t run from it forever, we will still have to face it at some point. And lastly, when we damage/hurt, there are two results in reality: 12) cost unpaid or 13) cost paid. Cost means consequences of our action, ex. if you committed crime you’ll have to pay for it like going to jail, or if you broke something you will have to compensate for material damage, or if you hurt yourself by drinking heavily or doing drugs, the cost will be your deteriorated health or else. It is important to separate cost which is physical from mental suffering, which could be found in all three paths if chosen. Please, remember that suffering could be of different degrees from smallest to highest: 14) resentment to self or others, pity to self or others or hatred to self or others. The point is that paid cost is enough, but thinking about what happened again and again is suffering. It is important to recognize that anyone can skip mental suffering and move into internal peace which will happen only if you 15) solve problem or 16) let go/forgive. 17) Share/help other people deal with the same problem. As Dalai Lama said, compassion and suffering are closely linked, we will not understand compassion without suffering. We would not relate deeply to other people without understanding what suffering is and that it is universal. 18) Focus on solving other matters. If you are not finding a solution or can’t really do anything about your problem, switch your focus… If you can’t change it, why be unhappy? if there is no cure, what is the point of suffering? Choose to solve another problem, more problems… Direct your energy and apply yourself where you can make a difference. 19) Learn how to recognize/solve problems. You gain learning experience and resilience. Next time it happens to you or someone else you will know how not to react and what to do instead, because you went through this experience already. Wisdom is when you learn to recognize the problem and not act upon it negatively or avoid it but wisely observe or look for solution (by learning from others or doing research). Meditation is useful in overcoming negative emotions. The opposite of wisdom is ignorance, when we react and act without being mindful. Suffering is mostly self-imposed and should be cured with positive thoughts, affirmations and mediation, etc. Finally you will find your personal significance in the column Meaning. The meaning of you going through all your life’s problems and suffering is sharing your experience or helping others to deal with the same problem (compassion), resilience/learning and making a difference where you can. So now think about all memorable problems and struggles you had in your life. Make a list of them. Ponder which of the three possible paths did you take? Respect your experience. What did you learn from your problems/suffering? Can you convert them into the meaning of your life/personal significance? What is it or what will it be? Most importantly, ONLY YOU can decide which problem resolution path you want to take and when to change it in order to get to internal peace.